If chief executives get the big bucks for their ability to put the best face on bad situations, then newspaper bosses really earned their pay this week at the annual UBS media conference in New York. With straight faces, the chiefs of McClatchy Co., the New York Times Co. and other major publishers told investors that things were looking up for the newspaper business because their sales would be down “only” 20% to 25% in the fourth quarter of the year after tumbling as low as 30% in prior periods. Newspapers are on track this year to produce their lowest advertising sales since 1986, representing a 43% drop from their all-time peak of $49.4 billion in 2005. Based on the historic sales slide in the first nine months of the year, newspapers are likely to generate no more than $28 billion in advertising revenues in 2009, thus shedding more than $21 billion in sales since 2005. In other words, newspapers appear to have gotten mighty close to losing almost half of their revenue base in a mere four years – a decline that began well before the economy began unraveling. Advertising sales matter because they traditionally have generated 80% of the revenues at most newspapers, with circulation fees providing the balance. The profound contraction of the advertising market has caused some publishers to begin ratcheting up subscription and single-copy prices, but the industry at the moment will live, or not, by advertising. While some demand for newspaper advertising undoubtedly will return when the economy recovers, a good deal of it will not, because many of the traditional advertisers have moved on. An alarming number of the staunchest newspaper advertisers – including thousands of retailers and auto dealers – succumbed during the worst economic calamity since the 1930s, so there literally is no hope of regaining their business. Many of the surviving advertisers – including retailers, employers, real estate agents and car dealers – are shifting ever-larger portions of their advertising spend away from newspapers to the web, where the costs are lower, audiences are highly targetable and response can be meticulously measured. As illustrated in the chart below, the speed and severity of the sales plunge since 2005 is unprecedented in the heretofore remarkably charmed history of the newspaper business in the post-World War II era. The collapse of the newspaper business most assuredly was aggravated by the downturn in the economy. But it is important to note that the sales decline was well under way before the economy cratered. It is a grave mistake to think, as some industry leaders apparently do, that the industry’s problems will be solved when the economy improves. From the end of World War II through 2005, newspaper sales climbed vigorously and almost continuously with only occasional minor setbacks during recessions. There was one frighteningly deep 9% sales plunge in 2001 caused by the tech wreck and the 9/11 terror attacks, but the industry quickly recovered when the economy rebounded in less than two years. Thanks to the housing boom and the cheap-financing bubble in the middle years of this decade, newspaper ad sales reached an all-time record of $49.4 billion in 2005. The rapid recovery for newspapers after the 2001 scare evidently led publishers to believe they had dodged the competitive threat posed by the Internet, which began emerging as a commercial force in the mid-1990s. In fact, as we know now, the interactive media in the last four years did more harm to publishers than they ever could have imagined, particularly by destroying their formerly lucrative classified advertising business. The want-ad business, which until a few years ago produced 40% of publisher revenues and better than 40% of their profits, was picked clean by lower-priced, consumer friendly websites offering highly optimized environments for searching deep inventories of employment, automotive and real estate listings. Based on projections derived from the industry’s actual performance in the first nine months of the year, classified advertising in 2009 is likely to total no more than $6 billion, or fully 65% less than the $17.3 billion in sales booked in 2005. The financial crisis and recession that commenced last year carved deeply into national and retail revenues. Many heavy newspaper advertisers went out of business. Most of the remaining advertisers trimmed their spending to save money, while directing ever-greater percentages of their purchases into low-cost and highly targetable interactive media. Based on the industry’s performance in the first nine months of 2009, national advertising appears to be on track to total some $4.3 billion for the full year, or 45% less than it was in 2005. Retail advertising, which is the meat and potatoes for almost every newspaper, is likely to drop this year to $14.8 billion, or 33% less than it was in 2005. It is difficult to think of another industry that fell so far so fast and ever regained its former vigor. If someone knows of any examples, please let me know. This is a searing analysis, Alan. But you've set a measuring stick -- newspapers regaining their former market standing -- that no one expects. A better question might be can newspapers stop or substantially reduce the revenue bleed. I've been torturing the same numbers and they lead to the same dreadful conclusion: The newspaper ad decline began well before the general recession and is deeper than prior recessions. (That said, residential real estate, autos, help wanted and finance have been hit particularly hard in this recession, which strikes at heart of newspapers' local advertising). I will offer a striking example from another industry moving from print to digital. Eastman Kodak's revenues from "Film, Photofinishing and Entertainment" declined from $4.254 billion in 2006 to $2.987 billion in 2008, a 29.8% decline. For the first nine months of 2009, sales in this segment are down 29.6%, so if the trend continues during the fourth quarter, the 2006 to 2009 sales decline will be approximately 50%. I've written about EK at What Hath Tech Wrought. This is very true. Much of the business lost during the past few years has not only left newspapers, they have left the third party advertising arena. Many companies are beefing up their own marketing efforts -- doing their own direct mail, e-mail marketing, electronic newsletters, etc. This business is gone for good and can not be retrieved through the web. This trend is hitting the trade magazine business very hard, as well. B2B magazines are seeing losses approaching 35% or more. I believe a piece of this business will return when times improve -- but much of it will not. Also true. But this loss started long before the web. I was a classified salesperson, then CAM, then ad director from 1981 to 1990. During that time we saw newspapers slow to react to the rise of auto traders and real estate tabloids. The retail side struggled with marriage mail. At Hearst in LA we launched a real estate tabloid in 1982 or '83 and talked of having it distributed not only in the newspaper but separately at grocery stores and real estate offices. The outside distribution never happened and as a result we were left to sell our low circulation vehicle against the might of the LA Times. As much as he's hated, Rupert Murdoch has his finger on the central issue: "The old business model based mainly on advertising is dead." Your analysis shows just how dead. I am amazed to see some newspaper executives still contend that some of the lost advertising is going to come back with an economic recovery, but I think it is gone foreever and we need to recognize that, move on, and find a new way of making money. For this industry, this recession brought secular changes that won't be reversed. What that means is more turmoil, more outsourcing and more layoffs. I think I need some more data points. 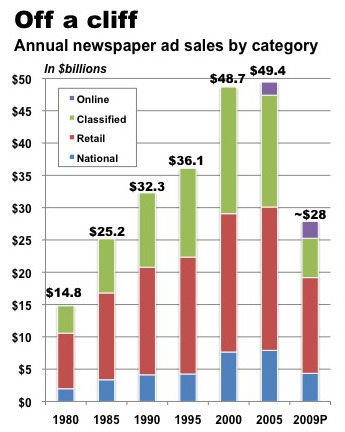 Newspaper advertising is down 43% in four years. But I saw on AdAge that Internet advertising share of the market was rising by 1% per year through 2013 to something like 15% of all ad spending. Is the WHOLE pie shrinking that MUCH? I can't seem to find any figures on overall advertising spending that tie into the 43% down. I am not disputing the 43% down, I have seen it - it is real. Newspapers are in the throes of big changes, and like any change of this magnitude it's painful. The old business model won't come back. But journalism as a profession must survive, whether it's for web publication primarily (most likely), for both print and web equally or mostly for print. The newspapers need to embrace the web heartily and create their own place, establish themselves as the most credible and analytical source of information and compete in that way. The alternative -- the anyone with a computer and internet connection is a journalist, regardless of credibility or training -- is frightening. Bloggers are becoming a big part of the distribution of news, but because they are not held to any standard of truth or credibility in a legal sense, they can say whatever they want. And people believe them, for better or worse. Newspapers and other kinds of professional journalists are held to pretty high standards in comparison, making it hard to compete and completely confusing much of the public audience. Like the presidential candidates told voters in Michigan, "those jobs just aren't gonna come back". Same can be said of newspapers. My reading of the trends is less scary. Why look at the raw numbers? Who does strategic business planning that way? Without taking inflation and circulation changes into account, ad revenue did peak 4Q 2005. Including just inflation, 2005 through 2007 were almost identical. Allow for circulation and advertising peaked in 2006 (at $930 per print subscriber versus $900 in 2005). Quarter-over-quarter there was no deterioration until 4Q2007, WHICH IS WHEN THE RECESSION BEGAN. AT most, we can postulate that 7% of the revenue loss was due to the Internet, and that's stretching it. It is also clear that the advertising didn't go elsewhere -- it evaporated. Employment advertising dropped FOR EVERY MEDIUM in 2001 and actually in % terms dropped more for the Web (these numbers are actually available -- Monster.com was a public company) because employers no longer had to advertise nationally to fill positions. The economy cooled AND the age cohort for young employables increased (by 800,000 a year in just 2 years). Except for the drop in employment advertising (mainly classified) classified held steady through 2006-7. But once the recession started, advertising evaporated FASTER for newspapers -- which kept revenue and margins high by raising ad rates -- than for other mediums. And steady revenues for the past decade were in contrast to steady growth all through the 90s (peaking in 2000). There's been no real investment in circulation since the early part of the decade. I don't even want to talk about editorial quality or investment in new ad tools. But local businesses come back fast after a recession and they will want to advertise... if newspapers make the right deals. The question is are we going to hit a sustainable level after this big advertising loss and will current downsizing be enough? I don't think we can answer that yet. Perhaps Apple will have a solution to the newspaper problem. Which is just as scary. I want to emphasize that newspapers CANNOT do same-old. They need more quality, more localization (doing what the Web cannot do as well), more ways to strengthen local advertiser relationships, more circulation (web, paper, electronic readers, skywriting...). They need more strategic thinkers. Otherwise, share will continue dropping and vulnerability to downturns will continue increasing. People keep going to conferences, ignoring data (or misrepresenting the data they DO use) and spouting nonsense. Sure as hell beats spending money (once we get some again). Mostly they're just bad business people. Most don't offer what they sell - advertising in a newspaper - on their web sites, or if they do, they offer it in the one type (classified line ads) that few people use anymore. Display ads is where the money is - but just try to buy display ads in a newspaper paper using their web site. For some reason they 'forget' that newspapers are an ad sales business. And they semm to try to be everything but. It's not very complicated, but they make it so. Sheesh! We won't be getting any guidance from E&P. Its demise was announced a few minutes ago. Excellent article and quick analysis! Although you did not say it, I am sure we all know the bottom line problem with newspapers. They aren't news, they are stale, they are not real time or right now. They don't allow instant engagement or sharing. As sad as it is to say, newspapers now may end up at the bottom of the "cage" before they are read. Alan: I think you are overly deferential to the idea that web metrics somehow give advertisers accurate information on how well their on-line ads are performing. The emphasis on page views and TOS at most websites is a weak metric for value of eyeballs. I personally feel we will shortly see the first big "circulation" scandals to hit websites, what with all the ways that numbers can be cooked or inflated through use of bots and plain old hacking. The ad revenue that has been lost by the newspaper industry has been captured by Google. Google will do $22 Billion in ad revenue this year, close to what the newspaper industry has lost since the top of the cycle. As Google has grown, newspaper's top line has shrunk. The key is to find a way to monetize the content of newspapers online. Newspapers still fill an important roll in providing opinions on local issues and relevant news for their specific markets. Good reporting is still valuable. Accurate news is essential. It's the globalization of news. Globalization leads to lower standards of work, ie the work goes to where it can be done the cheapest. Why WOULDN'T this happen for news? Cheaper means lower standards. How can it not? To survive, newspapers must get worse.